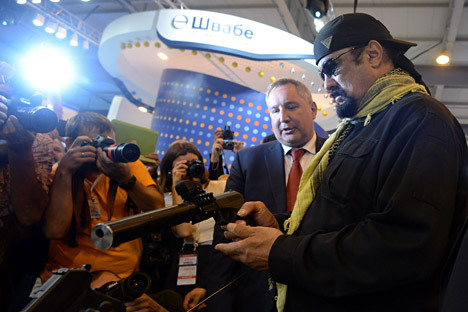 Russia's Deputy Prime Minister, chairman of the Russian Government's Military-Industrial Commission Dmitry Rogozin and American actor Steven Seagal holding an SPS Serdyukov autoloading pistol with silencer at the international exhibition "Oboronexpo-2014" in Zhukovsky, Moscow Region. "We tried not to draw attention and avoid the hype," says Seagal’s spokesman. US actor Steven Seagal, who recently obtained Russian citizenship, has arrived in Moscow, Seagal’s spokesman Anar Reiband told TASS on Nov. 22. "Steven arrived on Saturday, November 19, but we tried not to draw attention to this fact to avoid the hype," he said adding that Seagal’s Moscow visit program had not been made public yet. "Steven hasn’t received the Russian passport yet, we expect it to happen soon," Reiband noted. On Nov. 3, Russian President Vladimir Putin signed a decree granting Russian citizenship to Steven Seagal. Seagal himself said he was "tremendously grateful for this opportunity." Ha also said that "I always felt that USA and Russia should be best friends and allies. Despite the unfortunate propaganda going on I remain fully committed to working tirelessly towards this end and I am tremendously grateful for this opportunity." Steven Seagal is a renowned Hollywood actor, producer, screenwriter and Aikido expert. Seagal was born in 1952 in Michigan, USA. He has so far starred in more than 120 movies most of which are martial arts action films. As a young man he learned Japanese and Chinese and went to Japan to study martial arts. He spent a couple of decades there, only to became an actor at the age of 37.